This week, we thought we'd share the news about some on-going and upcoming events in regional archaeology. If pumpkins and costumes and candy aren't your thing, give these a try this weekend. The Council for Northeast Historical Archaeology, founded in 1967, is holding its annual meeting this year in Lancaster City. State Museum Section of Archaeology staff will be participating in the poster session Saturday evening with highlights of Archaeology Month excavations at Fort Hunter from 2006 – 2010. Thanks to the exhibit dept. for printing a sharp looking poster on such short notice. For a link to the CNEHA’s website, click here. 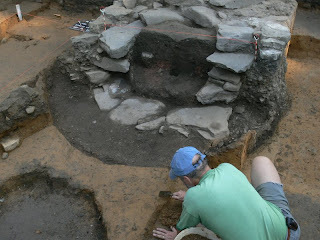 Also taking place this weekend although a bit to the south in Williamsburg, Va., is a joint meeting of the Archaeological Society of Virginia and the Eastern States Archaeological Federation. State Museum of Pennsylvania will be represented here as well with Curator Janet Johnson’s presentation on early archeological survey work conducted in Pennsylvania by the Works Progress Administration. For a link to the ESAF website, click here. One additional gathering to mention is still a few day off. On Monday, November 8th from 10:00 until 2:00, archaeologists from around the Commonwealth will gather in the East Rotunda of the Capitol to celebrate the importance of Archaeology. This event will be sponsored by the Pennsylvania Archaeological Council (PAC), the Society for Pennsylvania Archaeology, Inc (SPA), the Pennsylvania Department of Transportation and the Pennsylvania Historical and Museum Commission (PHMC). These organizations will provide a variety of exhibits on Pennsylvania archaeology. The theme is “Save the Past for the Future”. The goal is to focus the public’s attention on the significance of archaeological resources in the Commonwealth and to advocate for their preservation so that they may be appreciated and enjoyed by future generations. 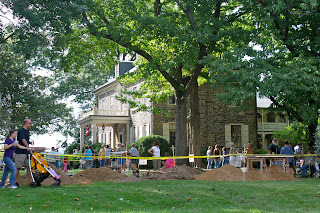 One of the main objectives this year for the Section of Archaeology’s study at Fort Hunter Mansion and Park was to continue explorations in the front yard of the stone mansion built in 1814 by then owner Archibald McAllister. 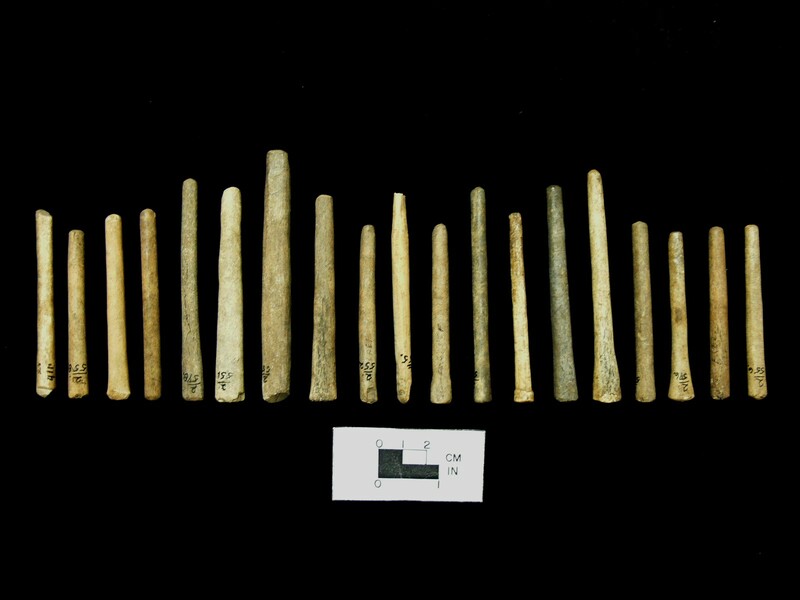 Trench excavations conducted last year revealed a feature of unknown extent containing a mixed assemblage of prehistoric and historic period artifacts. 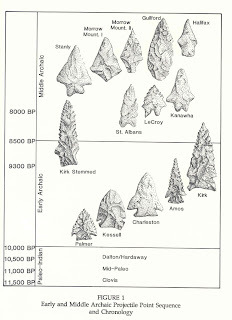 The limited area of excavation in 2009, the complex stratigraphy and the mixture of artifacts precluded a preliminary interpretation of the feature at that time though a series of hand dug auger borings dug that year suggested that it was of a sizable dimension. A thirty foot long by five foot wide trench oriented east west was emplaced to intersect with the 2009 excavation trench. 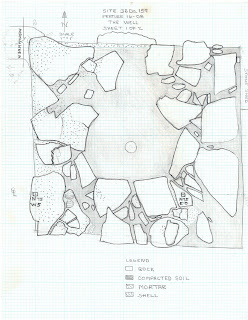 A two foot wide by forty foot long trench was also dug to intersect the east end of this larger excavation thus in plan view forming a T-shaped configuration . 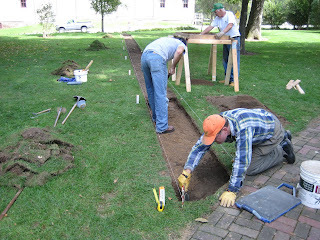 The purpose of interconnecting the two trenches was to intersect the front yard feature from several directions thereby enabling the archaeologists to better determine its depth and extent. Eight distinct soil deposits were identified across the horizontal extent of the large trench. As observed in the 2009 excavations, all were found to contain mixtures of prehistoric and historic period artifacts, indicating that the soils had been altered and/or replaced during the historic past. At an approximate depth of 30 inches the lag deposit consisting of small cobbles and pebbles appeared to have been disturbed by human activity. This lag deposit was naturally formed from river deposited gravels laid down during the end of the last Ice Age. The profiled south wall of the larger trench excavation shows that displaced remnants of the old cobble lag formed part of the feature initially encountered in 2009. 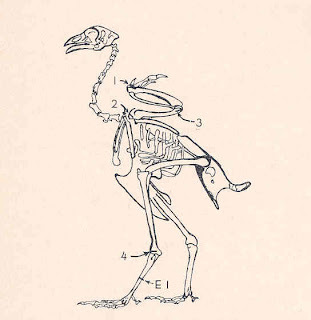 The trench profile also identified the feature’s entire cross-section. This included a 2-3 inch thick five foot wide linear mass, of compact, iron stained and gleyed silty sand in the deepest part of the feature. This feature, designated as Feature 50, is most unusual. Time constraints and limited personnel restricted our studies of areas beyond the large trench. 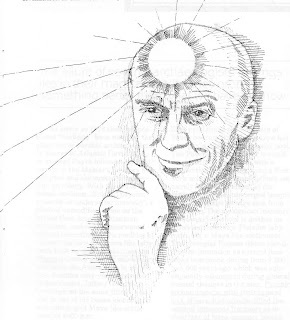 Several hypotheses have been formulated relative to the function of Feature 50. The first relates to the 18th century in a letter referencing the fort site dated July 7, 1758 which states that the “ditch is deepened”. 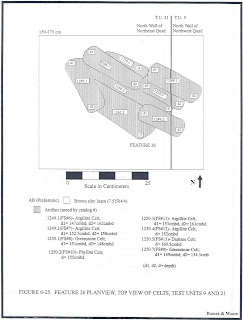 This information implies that there was then an existing fortification ditch or trench surrounding or adjacent to the fort site and that what we have identified as Feature 50 is a segment of this ditch. A second hypothesis is that Feature 50 is a segment of an old road. Supporting the latter hypothesis are the presence of scattered iron scraps found laying upon the cobbles and the corresponding parallel linear impressions found on the cobble lag. The former may be tentatively interpreted as lost or discarded metal and the latter as wheel ruts from repeated use of wagon traffic. 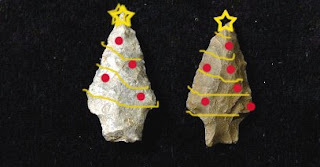 One of the primary goals for 2011 is to return to the front yard excavations at Fort Hunter and excavate a section of the property immediately west of the 2010 trench to further explore these hypotheses and potentially identify the most plausible interpretation of Feature 50. Archaeology Month continues throughout Pennsylvania this month and we hope you are seeking out those venues in your local community that help to Preserve Our Past for the Future. We took a break from excavations at Fort Hunter last weekend to take our dugout canoe to a public venue at Gifford Pinchot State Park, in York County. 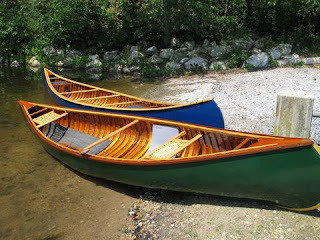 We were invited to participate in an event sponsored by The Wooden Canoe Heritage Association, Ltd.. This is a non-profit membership organization devoted to preserving, studying, building, restoring and using wood canoes, and to disseminating information about canoeing heritage throughout the world. There are over 1800 members in this association and the event was well attended from folks all over the northeastern U.S. If you ever have an opportunity to attend one of their meetings, you should. These canoes are incredible and the canoeists are very knowledgeable and skilled. 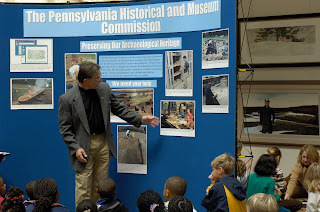 Five years ago as part of our public outreach for Archaeology Month in Pennsylvania the Pennsylvania Historical & Museum Commission, Section for Historic Preservation, took on the task of making a dugout canoe. 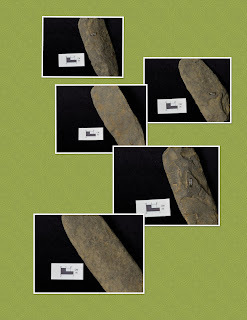 The method of construction was based on dugout canoes found in Pennsylvania and from early historic accounts of Native peoples producing these dugouts. A dugout canoe is simply a hollowed out log used as a watercraft. Dugouts have been found preserved in lakes and bogs all along the eastern seaboard and into Ohio. The oldest of these dugouts dates to more than six thousand years ago(BP). In Pennsylvania seventeen dugouts have been documented in bogs and lakes, mainly in the Poconos of northeastern Pennsylvania. 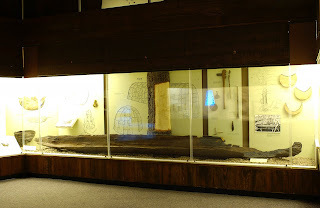 Dugout canoe on exhibit at The State Museum found in Mud Pond, Luzerne County, Pennsylvania. Our dugout was made from an Eastern White Pine log donated by Michaux State Forest through the Department of Conservation and Natural Resources(DCNR). The process of burning the log with a controlled fire and then scraping and chopping the wood was completed with the use of replica stone tools. 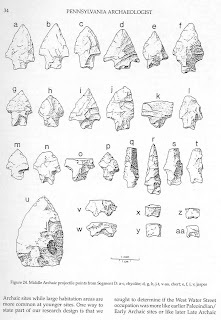 Archaeologists find stone tools and have many theories as to their use; this was an opportunity to test these theories and compare the edge wear on these tools. 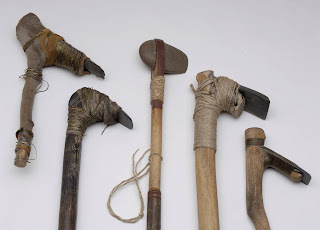 Stone tools, adzes, celts and axe which were used in making the dugout canoe. We have been sharing this dugout with the public at various venues including the Pennsylvania State Farm Show, Harrisburg’s Kipona Festival and recently to Cabella’s at Hamburg, PA. 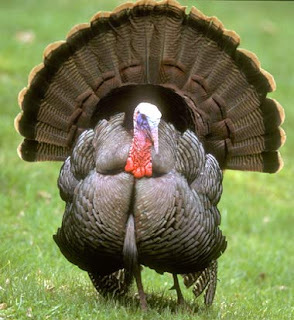 It has been subjected to all kinds of temperature and humidity and has stood the test of time quite well. A question that is repeatedly asked of us is “ Does it float?” . We tell our visitors Yes! On October 2nd, 2005 it traveled from Fort Hunter to City Island. And yes, that was the only time we've put it in the water until October 9th of 2010. Almost five years to the date the dugout was launched on Pinchot Lake. The dugout did well and the enthusiasm was contagious. Kurt Carr delivered a lecture and power point on the dugout process and shared the stone tools used to create the dugout with attendees. Everyone wanted to either make their own dugout or at least ride in ours. Now when folks ask us if it floats, we can be confident that yes- it floats! 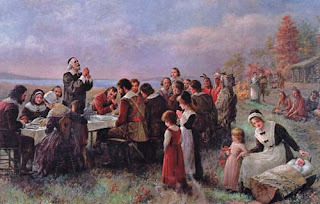 Today is our last day at Fort Hunter Park. We will have lots to write about next week and some more interesting observations on the well. Thanks to all of our regular visitors and the many volunteers who have helped us with excavations. Now the shift is to the lab and cataloging and inventorying the collection. In closing here are a few shots of our progress this week. View of well with about 3 feet of soil removed, note clear view of construction trench around perimeter. View after removal of 5 feet of soil from well surround, students from Franklin & Marshall College helping us with excavations on October 13th. We have been very busy this week having managed to get in four days at Fort Hunter with only one rain out. Public outreach has been terrific this year and we really appreciate all of the visitors we have had, many with information about their recollections of the layout of Fort Hunter Park over the years and changes they have seen in the landscape. Sunday, October 3rd was Indian Days and we had about 800 visitors that stopped by to view our excavations, many of them young scouts learning about Native American lifeways. Several school groups visited the site this week and we had two tours of the Archaeology/Anthropology gallery at The State Museum. Archaeology Month is in full swing in Pennsylvania so be sure to check for events in your area! School group viewing the excavations on a soggy Wednesday. Excavation of the well has been progressing very well, our current level is four feet below the top of the flagstone cap. We have been digging this in six inch increments and mapping at each level. The process we are using to excavate the well is to bi-sect the well and remove the west side of this feature. We are using this method for a couple of reasons. The first so that we can look at the construction method used to form the well and the second is the expense of scaffolding and rigging to excavate a well shaft. The following sequential series of images covers our excavations at the various levels we have identified, digging in 6 inch increments. Level 5, Friday afternoon at 3.5 feet below cap stones. Adjacent to the well area is our prehistoric land surface that dates to about 3- 4,000 years ago. We are continuing to map and remove the immense volume of fire cracked rock encountered at this level throughout our excavation unit. Each rock is mapped prior to removal and elevations recorded so that we can determine if the fire-cracked rock we are encountering is consistently appearing at the same level, indicating an intact land surface. The question remains as to what were the Native peoples that built these fires cooking or processing here? 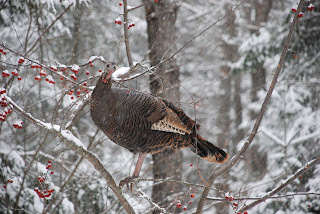 There have been a few points and scrapers recovered and the task this winter will be putting the puzzle pieces together to interpret this event. Large fire cracked feature prior to removal of FCR from unit. We found the large flake below this week in the fire-cracked rock level, any ideas? We have decided to continue excavations till October 15th due to the rain delays, so if you haven’t visited us at Fort Hunter Park, please do! Thanks to our followers, here’s hoping for good weather next week and some interesting fort related artifacts.